You don't tug on Superman's cape. You don't spit into the wind. You don't pull the mask off the old Lone Ranger. And you don't hire Kirk Douglas for a role that requires subtlety. If you want scenery chewed and nails spit, Kirk is your man; he perfected "shock and awe" before anybody ever told fables of weapons of mass destruction. Fans may remember him best as Spartacus or perhaps Vincent van Gogh, but Kirk's finest hour was his turn as caustic newspaper reporter Chuck Tatum, the anti-Clark Kent. No mild manners here. Tatum knows newspapers backward and forward, up and down, inside and out. He can print ‘em, wrap ‘em, and ship ‘em. If there's no news, he'll go out and bite a dog. Yet here he finds himself in Albuquerque, a $250 a week man ready to work for the bargain price of $50. He makes this magnanimous offer to Mr. Boot (Porter Hall), the belt-and-suspenders editor of the humble Albuquerque Sun-Bulletin. Boot isn't exactly impressed, but gives Tatum a chance to redeem himself after he drank and/or philandered his way out of every major city paper in America. 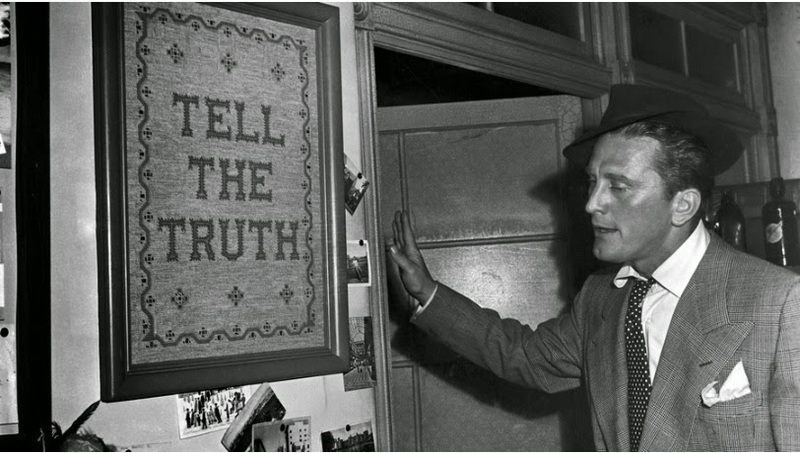 In case you can't tell that Tatum is a fish out of water, the message is delivered with a zinger when Tatum delivers his fire and brimstone speech about making news happen while sitting beneath a homemade macramé sign in Boot's office that reads "Tell the Truth." Tatum languishes in his hicktown hell for six months, bored but hardly humbled by his exile. Then the newspaper gods deliver him a miracle. On his way to cover a thrilling rattlesnake hunt, Tatum learns that a man named Leo Minosa (Richard Benedict) is trapped in a mineshaft in Old Indian Cliffs. As Johnny Law frets about how to get to Leo safely, the intrepid Chuck Tatum grabs a flashlight and plunges into the darkness to locate the trapped man and assure himself exclusive rights to the biggest story to hit Albuquerque since the Atchison, Topeka, and Santa Fe came to town. 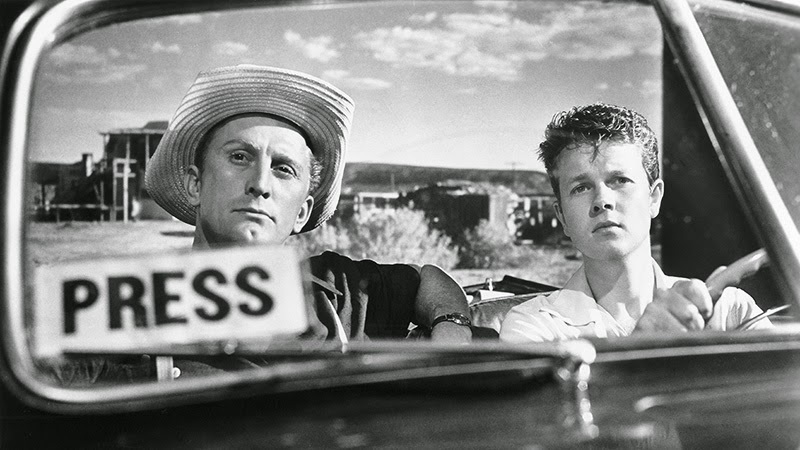 What follows is one of the most cynical, jaundiced films ever made about the American media and American culture, writer-director Billy Wilder's scabrous “Ace In The Hole” (1951). The engineers fear it will take nearly a day to shore up the walls enough to rescue Leo. One lousy day? You can't construct a solid narrative arc in one lousy day. Tatum, with the town sheriff in his hip pocket, convinces them to drill from above even though it will take a week to get to the man. Leo's a tough old soldier; he can last. Tatum covers every angle of the tear-jerking tale, making sure that the public gets to know the grieving widow… er, I mean wife, Lorraine (Jan Sterling). Never mind the fact that Lorraine thinks so little of her poor endangered spouse that she tries to split town right away, she's gonna play the grieving wid… wife and she's gonna like it. Especially as the tourists flock to town and pay for hamburgers and souvenirs before they go to ride the Ferris wheel hastily installed within comfortable viewing distance of the mine. Douglas leads with his chest thrust out and his bronze-plated chin dimple preceding him by a full stride, but he doesn't just alpha mail in his performance. Tatum's dial goes way past 11, but he knows how to turn on the charm when he needs to. In the film's most potent scenes, Tatum chats with Leo who is pinned under a mountain of rubble. He assures him that everything is going to be OK, that his wife loves him, and that everybody's rooting for him. Even Leo doesn't believe it, but he has nobody else to rely on; ace reporter Chuck Tatum is his only friend in the world. Douglas's firebrand performance is textured enough to indicate that Tatum knows full well that he's betraying Leo's trust, and that he even feels profoundly guilty about it. Yet he does it anyway, making Tatum's ersatz redemption in the final act ring even more hollow. The script, written by Billy Wilder, Lesser Samuels and Walter Newman, crackles with enough energy to keep up with its indefatigable star. There are great one-liners such as the time when Tatum urges the shy manners columnist at the paper to get involved with a trunk murder: "I could do wonders with your dismembered body." Not to mention the way Douglas spits acid every time he says the name "Mr. Boot." But the film is also full of myriad details that don't call attention to themselves, such as the way the price keeps rising on the sign that invites tourists to "visit Indian Cliffs" or the gawkers who compete with each other to prove that they were the first ones on the scene. "Sunset Boulevard" was a bleak indictment of Hollywood and the pursuit of fame, but it looks positively Panglossian compared to the scorched Earth policy of "Ace in the Hole." Don't go looking for the American dream here, and you sure as hell better not hold out for a happy ending. Good news doesn't sell newspapers. You remember newspapers, don't you? Criterion's 2007 SD release of “Ace in the Hole” was described as being presented “in its original aspect ratio of 1.33:1” and was also “window-boxed” as was Criterion's custom at the time. This 2014 release is presented “in its original aspect ratio of 1.37:1” and is not window-boxed. I mention this since I know some of you like to go to war over these things. You can see slightly more information on the left and right in the new transfer if you compare screen shots between the two versions, though you'll have to look closely. What matters most is the upgrade to the 1080p transfer. From the Criterion booklet: “This new digital transfer was created in 4K resolution... from a 35 mm duplicate negative, with specific portions taken from a 35 mm acetate fine-grain assembled from several sources; the film was restored in 2K.” If this high-def version has been built from a hodgepodge of sources, you really couldn't tell from the final product which features consistently sharp image detail and strong black-and-white contrast throughout. Maybe a few shots are just a tiny bit softer than others, but nothing substantial. This is a dual-format release which includes two DVDs (one with the film, the second with most of the extras), and a single Blu-ray disc. The DVD transfer has not been reviewed here. The linear PCM monaural track has been “remastered at 24-bit from a 35 mm optical soundtrack print.” There's no noticeable distortion or damage on the audio track which may be something we take for granted but shouldn't in the case of a 60+ year-old film like this. Optional English subtitles support the English audio. Criterion has imported all of the extras from its 2007 SD release; the features spread across two discs in the SD version are stored on a single Blu-ray disc now. The film is accompanied by a commentary track by film scholar Neil Sinyard which is packed with information and moves along briskly. The most substantial extra is "Portrait of a 60% Perfect Man: Billy Wilder" (1980, 58 min. ), a documentary directed by Annie Tresgot. The entire film is a conversation between Wilder and critic Michel Ciment, and showcases Wilder at his showman's best, brimming with colorful anecdotes and pungent one-liners. "Billy Wilder at the American Film Institute" (24 min) presents excerpts from a 1986 interview by George Stevens Jr. conducted at AFI. The collection also includes interviews with Kirk Douglas (1984, 14 min.) and writer Walter Newman (excerpts of an audio interview from 1970, 10 min.) Spike Lee also chips with a video afterword (5 min.) We also get a Stills Gallery and a Theatrical Trailer. 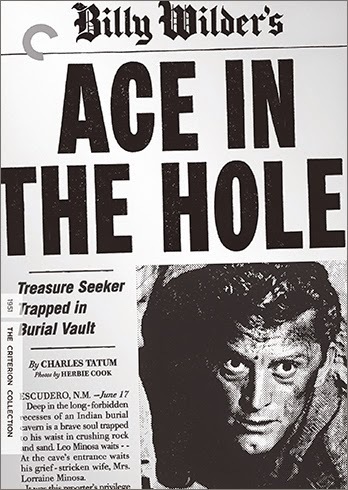 "Ace in the Hole" was a box office failure on its initial release, and flopped once again when it was re-released as "The Big Carnival." That does not detract from the accomplishments of the film which, for my money, is Billy Wilder's best. As far as scathing condemnations of the American media go, "Ace in the Hole" has aged far better than the histrionic "Network" despite being a quarter century older. This Criterion Blu-ray upgrade doesn't offer any new features, but provides a beautiful high-def version of a genuine American masterpiece.